This, in spite of the fact that I didn’t get the opportunity to do anything or take in any of the lectures. I spent the day at the FOSS Force booth, the first ever for our site at a conference, writing Friday’s column between chatting with folks who stopped by the booth. Jeremy Sands, the events main organizer, was delightful as usual, and made sure that I got a couple of T-shirts. I finally got to have a face-to-face meeting with Rikki Endsley, a community manager for Red Hat’s Opensource.com. She’s also been a good friend to FOSS Force and has helped us out on several occasions (and will be featured tomorrow on FOSS Force in a video interview with Robin Miller), Although we’ve “talked” several times in the past by email, this was our first “official” meeting, and I’m happy to report that she’s just as pleasant in person as she is via the written word. I’m looking forward to connecting with her again in October at the All Things Open conference in Raleigh. I also got a chance to meet up with Don Parris, who signed on to write technical articles for FOSS Force at last year’s SELF. You might remember, we ran quite a few memorable articles under his byline, until his real life got too busy and hectic for him to be able to continue to contribute here. I made sure to tell him that he’s missed and is welcome to come back to write for us at any time, but unfortunately he still doesn’t have the time. Bummer. The FreeBSD folks, along with some representatives of PC-BSD, had the booth next to ours, and their offers to help as I was setting up the booth exactly fit the “hospitality” theme that Sands works to nurture at the conference. I picked up a card from Ken Moore, the lead developer of the made-from-scratch FreeBSD desktop Lumina. He’s a great guy, as is Josh Smith who, if memory serves, is connected with the PC-BSD project. Unfortunately, the end of that day also ended my good times in the Queen City of Charlotte. I’d booked a room for Friday and Saturday night at the Econo Lodge & Suites Airport Hotel (704-392-0600, in case you’d like to call to book a room or something) which is located just across the freeway from the conference. About 5 p.m. I drove to the motel and checked in. The room was nothing special, but it appeared to be clean and I was okay with it. All went fine until about 6 a.m. when I was awakened by a call from the front desk. There had been an “incident,” I was told. Could I come down to the front desk. “What kind of incident?” I asked. Groggy with sleep, I took the elevator down from my third floor room in my night clothes. “Do you know about your car?” the desk clerk, a soft spoken young lady asked. 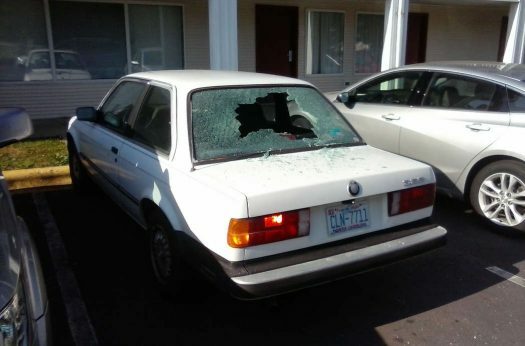 My 1987 BMW sitting in the Econo Lodge & Suites Airport Hotel parking lot after a vandal threw a brick through the rear window. Someone had thrown a brick through the rear window. This was surprising, since the car was parked right next to the motel’s front door. According to the desk clerk, a motel guest had called the front desk at about 4 a.m. saying they’d heard the sound of breaking glass coming from the front parking lot. The clerk didn’t investigate until two hours later when another guest coming in from outside notified her of a car in the parking lot with a broken window and glass all over the place. She called the police who ran the tags, which identified me as the owner. She also filed a police report, but didn’t notify me until after the police had left. What did the Econo Lodge do about this? Just as you’d expect. They were very sorry this happened, but they took no responsibility. They didn’t even offer to comp the room for the night. The only thing they did agree to do was to let me cancel Saturday night’s reservation without having to pay a late cancellation fee. At this point I should point out that I drive a 1987 BMW with a book value of less than $1,000, so I only carry liability insurance. The entire cost of replacing the glass would be coming out of my pocket. I didn’t know how much a replacement would cost, but I did know that it would be more than I can afford since I live on a very meager social security retirement income which had recently been reduced by over $120 monthly to cover Medicare Plan B — I just turned 65 in May. I decided to cut my loses and return home, since I really couldn’t afford the trip to Charlotte in the first place. I stopped by SELF, apologized to Jeremy Sands for not remaining for the entire conference and said my goodbyes to the BSD folks. Sands, knowing my financial situation, suggested that I start a GoFundMe campaign to raise money for the replacement glass, and said he’d gladly contribute if I did. Hearing this, the guys with BSD all chimed-in saying they’d contribute as well. I thanked them all for being so nice, loaded up the stuff from the booth and returned home. That should’ve been the end of it, but it wasn’t. It only got worse. Bed bug bites picked up at the Econo Lodge & Suites Airport Hotel. 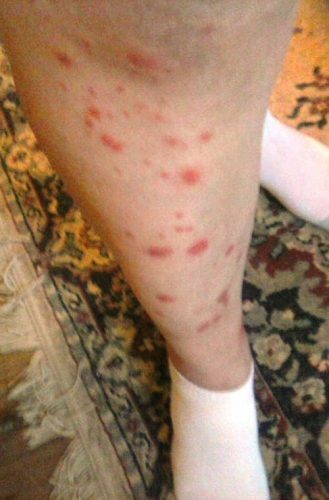 Early Saturday evening, I noticed that I had developed some bites, some of them looking more like rashes, on my legs. I didn’t think much of it. Living out in the country in an old farmhouse, bug bites are fairly common, and multiple bites — although not as bad as this — are not uncommon. I figured they’d go away soon enough. On Sunday I became more concerned. There were more bites with one area turning into a large rash looking area that appeared to actually be multiple bites. On Monday, I stopped by the Urgent Care Center. You’ve probably already guessed the verdict: bed bugs. The house in which I live is infested, of course, and in this old farm house if the infestation takes hold and gets established I’ll probably never be able to get rid of them. I spent Monday spraying bed bug poison in all of the places I figure they could be, and spent the night on a chair in the living room because I’d sprayed my mattress and thought it too soon to safely sleep on it. The spraying has helped, but it appears as if I’m still being bitten. I say “appears” because I have so many bites as it is that I can’t tell anymore if I’m looking at old bites or new ones. From what I’ve seen online, having a house treated for bed bugs costs on average about $1,500 and can take as many as four treatments. A single treatment at half that would be completely impossible for my household to handle. Crystal told me that Crabs would look over the report and would contact me. Next I called corporate in Chevy Chase, Maryland. Econo Lodge is owned by Choice Hotels and isn’t too forthcoming with handing out the phone numbers or emails of its officers. I started by calling the number for Guest Relations. After being put in line for over a half hour twice, I called Stewart Bainum, Jr., who I’d found is the Chairman of Choice Hotels (and the son of its founder). I bluffed my way to being put through to Bainum’s office. I didn’t get past his secretary, but when I explained the situation to her she put me through to a customer relations person named Tim (again, no last name available) after talking to him herself first. Tim dutifully took all of my info, including the police report number and information about the bed bugs, then went through the spiel about how the local motel isn’t owned by the corporation and that it will ultimately be up to the local owner to resolve the issues. He added though, that the local motel owners will be sent the case information and must contact me within 72 hours. He did request that I send photos of the auto damage and the bed bug bites to be included in the file. I’m glad that you have reached out to us about your stay at the Econo Lodge Inn & Suites Airport. I was disappointed to hear of the unfortunate incident you described. I know this is an important issue to you and want to ensure you that we are reviewing this. I have also sent your concerns to the hotel for their input. The hotel will be in touch with you over the next 72 hours to respond. Choice Hotels’ properties are independently owned and operated, and we rely on the hotel to make the final decision. I do hope you will give us another chance in the future to show you what a great experience you can have with Choice Hotels. If you should need further assistance, we’ll be waiting with a smile just a call or email away. I don’t expect that these people are going to make me whole. I’ve also called the Mecklenburg County Department of Environment Health, who will be sending someone to inspect the motel room where I stayed. As much as I like SELF, I doubt I’ll be attending next year (but we’ll try to have someone on the scene to cover it for you). I’ve had it with Charlotte. Yikes! I understand bed bugs are a horror to eliminate. Good luck. Did you set up the GoFundMe? @Mike S. Not yet. Trying to get a handle on how much to seek. I should know by tomorrow if we’re going to need an exterminator. OMG! That’s a horrible experience. Do let us know the GoFundMe account when you set it up. The brick was bad, but those bites look really bad. @charlie-tca Yeah, the bites are definitely the worst. When I set of the GoFundMe account, I’ll announce here as a comment to this article. I don’t feel comfortable writing an article for FOSS Force about a purely personal funding issue, so you can subscribe to this thread below to get email notifications on comments to this article. Sorry to hear about your ordeal, Christine. I once had reservations for a Best Western hotel. As in your experience, the hotel was very clean. I had read about bed bugs and how to check for them, so upon entering my room, I sat my luggage on a luggage rack (not the floor or furniture) and flipped the mattress. Brown small bugs began scurrying from the seams of the mattress. I took my luggage and went to the front desk. In front of a customer, the clerk asked me if there was a problem. I told him about the bed bugs and asked that my reservation be cancelled. The other customer and his wife proceeded to their room, even after hearing my complaint. Bedbugs are rather heat sensitive. As it happens I live in Phoenix, AZ, where the summer daytime temps routinely exceed 45C (113F, tho I’d say exceed 110F were I using it as primary). My folks came to visit that summer and we went traveling for a few days, four nites IIRC, so I left the house (mobile home, so up off the ground) without AC, and when I came back, no more bedbugs! Note that I routinely left the AC off for the day while I was at work but that was obviously not enough time, as it didn’t do the trick. But the 4 days and nites in a row worked, rather accidentally for me as I didn’t even know heat was a treatment for bedbugs until I looked it up after the fact, and indeed it is one commonly used treatment, generally with something else tho. Now I doubt you live anywhere as hot as Phoenix, but it is summer in this hemisphere, so if you try the heat route at least you won’t have as far to heat things up as if it were winter. Do some online research and see what temp and how long — obviously the 46C/115F-ish highs, 32C/90F+ lows for several days in a row did it for me, but you may want to try hotter for shorter periods and possibly cooler nites. Then I’d suggest putting your bedding, pillows, etc, and any close you believe may be contaminated, thru a high-heat drier cycle. For the house, you can try heat, say a propane heater or the like, but use your head as I’ve seen reports of people burning down their house trying the heat thing with open flame or the like and little or no supervision. Then poison selected areas where the heat likely won’t get, probably cracks and corners near the floor if you have concrete/stone floors that won’t get hot enough with the heat application. They like cracks. So you can try sealing up cracks too — before the heat thing I had tried sealing some of them with roofing tar I had where I either didn’t care about the look or could paint over. Hot glue may work too, if you fill the crack well enough, and will be considerably less messy. That would eliminate them from cracks where they had been hiding, but it wasn’t enough by itself — I needed the heat. You can probably find much more detailed recommendations online, but again, use your head — burning the place down may indeed solve that problem but it’ll leave you with a much worse problem! As to where you might stay if you do treatment over several days… I don’t really know what to recommend, except to recommend again that you do the high-heat drier cycle on clothing, etc, you take with you, to avoid infecting them. Unfortunately, you may also have to consider your car possibly infected. You could probably poison the carpet if you don’t want to take it out, but you may need to take out the seats and heat-treat them with the house. However, you can likely find better recommendations online regarding the car than I can give you. That won’t be free, but provided you don’t get stupid and light your house on fire, it’s likely doable for say $750 or less, half of that $1500 single treatment you were quoting. Should be a good starting point for more research, at least. Do let me know when you’ve setup the GoFunMe – will be happy to contribute to a friend of Open Source. Dispute the credit card charges. You could file a dispute with the credit card company. That will either get their attention or get you a guaranteed refund if they ignore it. > Dispute the credit card charges. At the very least. I think it may be time to see if you have a pro-bono lawyer service in your area. The bedbugs are definitely their responsibility. In USA, Fred Crabs gets YOU! My condolences about your trip Miss Hall, I would follow the advice of some of the posts here and get a lawyer, the bedbugs are DEFINITELY their responsibility, and they should either reimburse you full or else pay for whatever the cost would be for treatment of your clothes. I had to stay in a StayBridge hotel for about a week or two, my mom my younger brother and myself (Her house burned down du to a neighbor’s negligence!) and they put us in a room and thank GOD my brother was in the room lying on the bed and paying attention. He noticed a bed bug on our FIRST NIGHT THERE!, We immediately left the room, went to the lobby, notified the manager AND called the Dept. of Health with the address, they Health Dept sent an agent out IMMEDIATELY and he arrived within two hours, they placed us in a different room, but it was “plastic wrap EVERYTHING” and do NOT leave clothes ANYWHERE but in the suitcases, which were all left on the dressers! (off the floor!) In the end we got a lawyer to get them to “eat” the cost of the treatment of our clothes, and to swallow the entire cost of our stay there. There is NOTHING in the little contract you sign when you’re making the reservation or checking in at the desk that states that YOU’RE responsible for BUGS that you didn’t have BEFORE you arrived there! P.S. I’ll definitely contribute to your GoFundMe campaign…just lemme know….. I heard that the bugs are attracted by the carbon dioxide you exhale. I stopped an early infestation by placing a fan near my head blowing away. This confused their sensors sufficiently over a week to starve them. Late to the party as usual, but I also want to know about your GoFundMe!